Hi, My name is Lourdes, and this is my first blog post. I just started a YouTube channel and the other day I posted an outfit of the day video. So here I'm going to tell you what I wore that day and from where I bought the items. The shirt I'm wearing is my all time favourite shirt. It is a creamy looking shirt and on the pockets it has small gold flat studs but as you can see in the above picture that day I wore a sweather on top of it. I like layering sweathers on shirts a lot and I do it all the time. 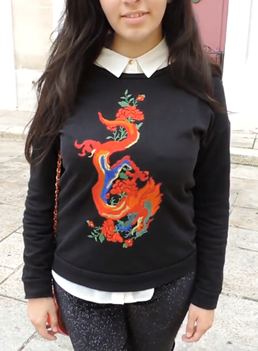 This sweather has a detailed embroidered dragon in front with so much colours. I fell in love with it the minute I saw it when my mother gave it to me as a gift. On the lower part I wore a sparkly velvet leggings. 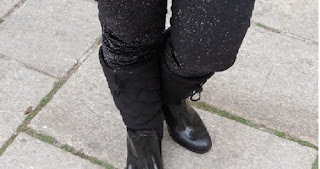 The colour of the leggings is black with silver sparkles and a soft, velvety fabric. I have to say that the glitter falls out even after a few washes, so you have to be careful where to sit. The next thing is the boots. These are just simply plain black boots with a little bit of detailing in the top part that is made of fabric and woven like quilts and the bottom part of the boots is just plain, shiny silicon. The boots can be warm in the top part but keeps your feet cold at the bottom silicon part. 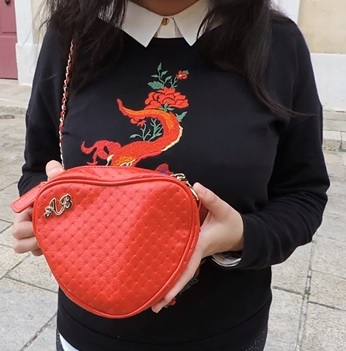 I completed the look with a small cute red heart-shaped bag. It might be small but you can easily fit a packet of tissues, your mobile phone and some money.